It's October which means it is Halloween month! Most of you will probably be going out or have parties and be dressing up for the occasion so this year i thought i would do a Halloween makeup look which is super easy. I didn't want to go with the typical cat face so i went for a Black Swan Makeup Look which is perfect for Halloween. You can adapt it any way you like. I found it best to apply the white face paint with a damp beauty blender/sponge to create a flawless finish. I did try with a brush but it went very streaky! Apply enough to cover your face, eyes and neck. I left it to set in for a few minutes and then applied my Vichy Loose Powder with my Real Techniques Powder Brush. I thought as my face is white i didn't want to use normal contour products so i used my KIKO 238 Eyeshadow which is a grey shade which was perfect to contour with. You can definitely do a more harsh contour as its Halloween! The main part of the look is the eyes. I used my Seventeen Wet Look Liner which has amazing staying power! This liner is the glue that holds this look together. I used this to create the outline from my inner brow down my nose, my tear duct to my nose and then created outward strokes to create the feather affect. I then used the liner to create small feather strokes along the outline and on top of my brows. This liner is perfect with the brush being small and helps create perfect lines. Once dried i then went in with a deep purple and red from my Revealed 3 Palette filling in odd spaces between the liner sections. I also covered my whole lid with the deep purple shadow and lined my bottom lashes using the purple & red shades and blended out. 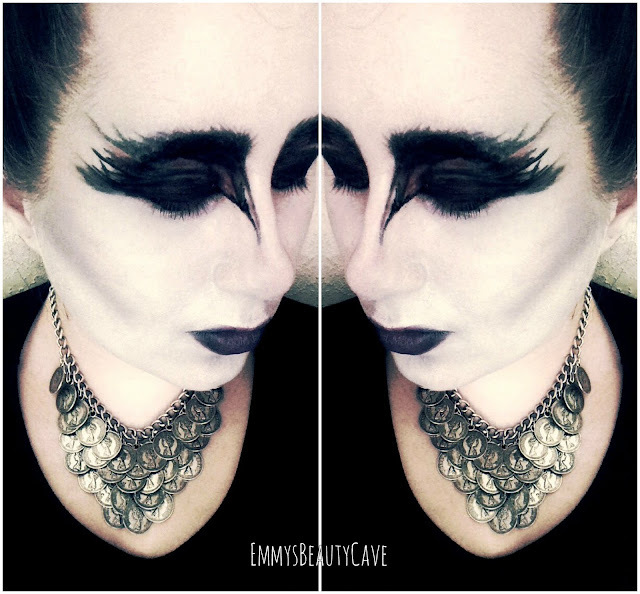 You want to try a create a magpie/crow bird look. I used my Topshop The Damned Lipstick which is a gorgeous purple shade. I then went in with a black shadow from my Revealed 3 Palette and applied it on the corners of my lips using a small lip brush and dragged it into the center of my lips. What are your favourite Halloween looks? This is amazing! Oh my god. I can barely apply lipstick let alone that! 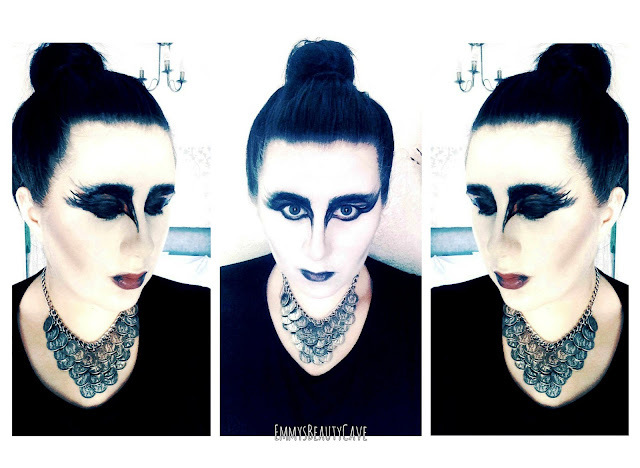 I did Medusa last yr and my saviour had to be sealing gel from illamasqua. I created scales using eyeshadow and sealed them with the sealing gel and they stayed for over 12 hours. I highly recommended that and the make up revolution aqua seal for a cheaper option. This is amazing Em! 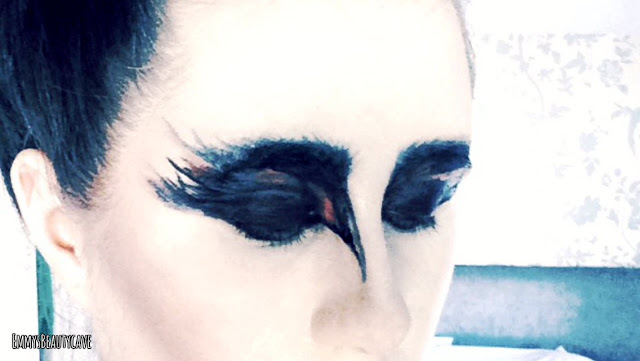 You look incredible, I would've never thought about a black swan for halloween but it's fab! That is amazing!!! I love it! You're really talented, the makeup looks gorgeous, and I find it perfect for halloween! This looks amazing and you've made it look so easy to recreate!